The Warrior Ritual GT2 Pro Goalie Leg Pads continues the tradition of combining lightweight, balanced feel with pro level performance in a package that goalies of all styles can excel in. By introducing new technologies such as HyperComp and 360 ActiveDrop to a classic style leg pad with increased flexibility the Warrior Ritual GT2 Pro is sure to win over goalies looking for a lightweight and flex in a pad. The biggest additions to the Ritual GT2 Pro over previous model are the 360 ActiveDrop and the HyperComp reinforced thigh-rise, both bringing added value and performance while dropping weight and maintaining a balanced feel. A conventional leg channel keeps the pad centered on leg while the goalie is in an upright stance unless the pad is worn extremely loose. In contrast, the 360 ActiveDrop leg channel encourages the knee and thigh segments of the leg pad to drop lower covering more five-hole while the goalie is in an upright stance and during butterfly slide transition. All this is accomplished while still providing a secure feel and fit. The addition of Warrior’s HyperComp material was introduced on the Ritual G4 Pro line and now is carried over into GT2 Pro as well. HyperComp is a lightweight composite material that is lighter and stronger than traditional high-density foams found in goalie gear. In the Warrior Ritual GT2 Pro leg pads the HyperComp material is used to reinforce the thigh rise of the leg pad to maintain a thin profile without sacrificing stability to keep a strong seal on your five-hole. The Warrior Ritual GT2 goalie leg pads feature an integrated knee drive system for a quicker response to the goalie’s movements and a faster butterfly. The knee drive combined with the 360 ActiveDrop leg channel on the Ritual GT2 Pro creates one of the fastest seals on ice. The GT2 Pro leg pads knee cradle has also been extended to the same length as the G4 Pro to accommodate knee pads of all sizes, and the adjustable strapping can be made narrow, wide or for across knee strapping, or completely removed for knee to calf strapping. The same innovative strapping found on the Ritual G4 Pro pads is featured on the Ritual GT2 Pro leg pads, with the exception of the stock toe ties. However, the active response toe straps are included separately with the pads if needed. Though the strapping is the same the Ritual GT2 Pro leg pads feature a rounder leg channel for a tighter feel, a traditional outer roll to ensure pucks stay in front of the pad, and a single outer knee break below the knee for added flexibility compared to the Ritual G4 Pro leg pads. Another innovation on the Warrior Ritual GT2 Pro leg pads is the geometric torsion design that allows for a flexible feel without sacrificing coverage. Torsional flex points below the knee and ankle allow the tapered boot to tilt forward and seal along the ice without causing the thigh rise to lift. This design provides a complete pad seal along the ice from boot to thigh-rise while still giving goaltenders a flexible feel. The New graphic on the Ritual GT2 Pro leg pads allows for complete customization with plenty of zones and unique diagonal lines that straighten out when in your stance. The GT2 Pro leg pads include the GT2 knee guards as well as a carrying strap for easy over the shoulder transportation. Overall the Warrior Ritual GT2 Pro leg pads are perfect for a goalie looking for pro level performance in a flexible unit that seals the ice well and holds its shape over time. Weight: 4.15 lbs. 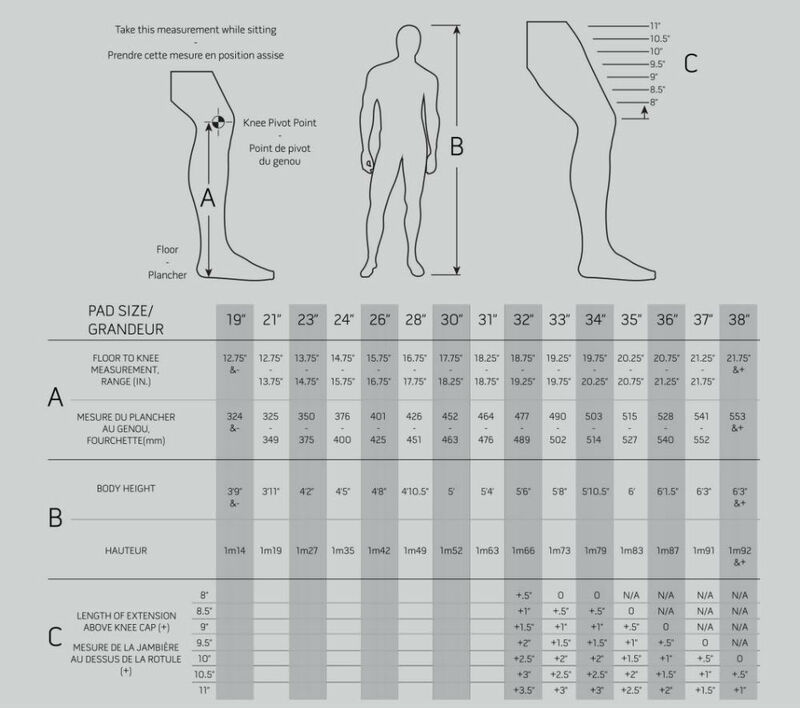 Weight of a single leg pad measured in pounds (Sr 34" Int 30" Jr 28" Yth 23"). Strap Type: (2) Velccro, (1) Bungee w/ Clip Type of attachment strap.